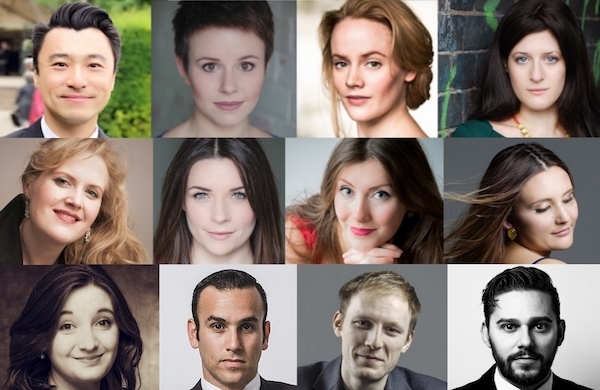 Our latest Audition Oracle Singers Preparation Award of £300 goes towards four singers preparing to put on a performance of Handel's first oratorio Il trionfo del tempo e del disinganno. 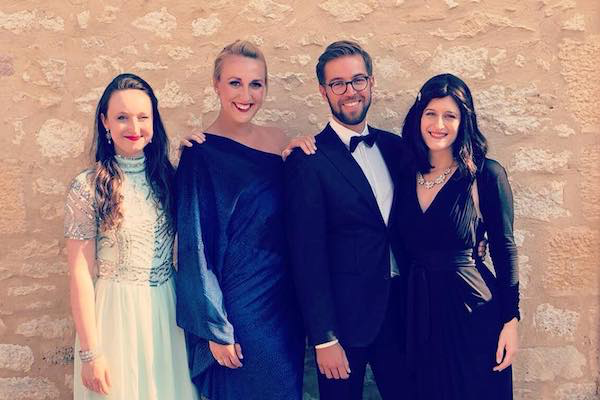 Susanna MacRae (soprano), Thalie Knights (mezzo-soprano), Clara Kanter (mezzo-soprano) and Matúš Šimko (tenor) are taking the initiative and creating their own performance opportunity. Thalie Knights talks to Audition Oracle about the project. We are four young artists on the cusp of our professional careers. We were all offered a place on a French Baroque Festival academy in August (Festival du Perigord Noir) where we were given the opportunity to study and interpret our roles (Bellezza, Piacere, Disinganno and Tempo). As this was primarily a training programme, each role was shared with 3 other singers, and so we are yet to perform these fantastic roles in their entirety. To perform Handel's first oratorio - 'Il trionfo del tempo e del disinganno' - to a UK audience, and create for ourselves the opportunity to perform each of our respective complete roles. 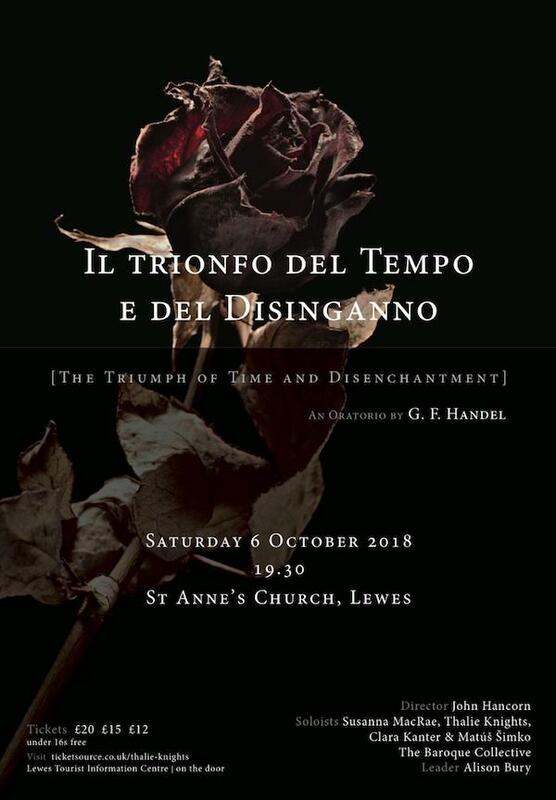 The performance is booked for St Anne's Church, Lewes, 7.30pm on the 6th October 2018. We'd love your attendance more than anything, but if this is not possible, we would be very grateful for a donation! Money secured from generous donations and bursaries, such as that of Audition Oracle, will go towards our costs, as it would be fantastic to be able to raise as much of this as possible, so that we can go into the concert and focus on the music, rather than the maths. Handel's first oratorio, 'Il trionfo del tempo e del disinganno' (The Triumph of Time and Disenchantment) had its premiere in Rome in 1707. The plot surrounds the conflict between earthly pleasures and divine grace. Bellezza (Beauty) knows that one day her beauty will fade, but Piacere (Pleasure) tries to convince her that this is not the case, and in doing so, promises her eternal beauty. Tempo (Time) and Disinganno (Disenchantment) do their best to warn Belleza that like a flower, beauty and it's charms will not last. Bellezza eventually discovers the truth, and frees herself from vanity, and in doing so, turns her heart to God. Susanna MacRae graduated from the Royal College of Music, London, where she studied with Jeffrey Stewart (Vocal Studies) and Nigel Clayton (Piano). Currently, she studies in London with Sheila Barnes and Jeremy Silver. On the operatic stage Susanna has recently completed a successful tour of Italy and Spain performing Galatea (Acis & Galatea) with Ad Parnassum as well as Emilie (Les Indes Galantes) in March for Benslow Baroque Opera. Later this year Susanna will perform the role of Bellezza (Handel's Il trionfo del tempo e del disinganno) as a Périgord Noir Festival Young Artist, Frasquita in a touring production of Bizet’s Carmen with Barefoot Opera Young Artists and Euridice (Gluck’s Orfeo ed Euridice) with Grassroots Opera in a tour of south-west England. This year she has competed as a finalist at The John Kerr Award for English Song, Cheltenham Baroque Singing Competition and in September has been selected as a semi-finalist in The Froville International Voice Competition in France. Solo highlights include appearing as soprano soloist for numerous choral societies across south-west England and she regularly appears on the recital platform around London and the South, collaborating with Guy Murgatroyd (Piano) and Aidan Phillips (Harpsichord). Susanna is grateful for the generous support of The Nicholas Boas Charitable Trust in supporting her studies. French bi-lingual Thalie trained with English National Opera on their distinguished Opera Works programme (2014/15) and was a 2016 Britten-Pears Young Artist where she performed Bach Cantatas under the guidance of tenor Mark Padmore. A finalist of the 2017 London Song Festival Lieder competition, Thalie was personally selected by Malcolm Martineau to take part in his residential masterclass series in Crear, Scotland, in January 2018. 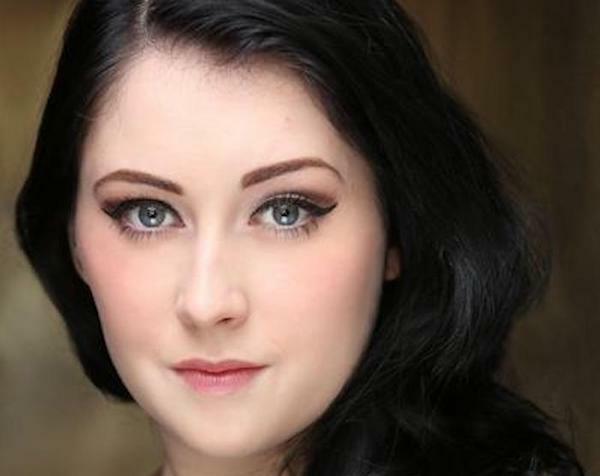 She is an alumna of the Royal Welsh College of Music and Drama. This season Thalie will sing the role of Piacere IL TRIONFO DEL TEMPO E DEL DISINGANNO (Le Festival de musique du Périgord Noir), Prue THE DANCING MASTER (The Malcolm Arnold Festival) and chorus for Longborough Festival Opera in their production of Wagner's DER FLIEGENDE HOLLANDER. With ENO she studied Bradamante ALCINA, Cornelia GIULIO CESARE and subsequently sang Medoro ORLANDO in the final performance - Landscape - at the Bloomsbury Theatre, London. Operatic roles include Mallika LAKMÉ, ARMIDE, Phèdre, cover, HIPPOLYTE ET ARICIE, Second Lady THE MAGIC FLUTE, Frédéric MIGNON, Mrs Kneebone A DINNER ENGAGEMENT, Maman L’ENFANT ET LES SORTILÈGES, Sorceress DIDO AND AENEAS, Andreloun MIREILLE. For Longborough Festival Opera, Thalie has sung Chorus for their productions of Beethoven's FIDELIO and Gluck's ORFEO ED EURYDICE. Clara read Social and Political Sciences at Clare College, Cambridge, before studying at the Guildhall School of Music and Drama, finishing in 2018. Clara’s operatic roles include Junon (Actéon), Mercedes (Carmen), Pitti-Sing (The Mikado), Sorceress (Dido and Aeneas), Dame Carruthers (The Yeomen of the Guard), Third Lady (The Magic Flute), Zita (Gianni Schicchi), and La Zelatrice (Suor Angelica). She was a soloist in Stockhausen’s Mittwoch aus Licht for Birmingham Opera Company, and has performed roles at Buxton Opera House and the Arcola Theatre for London’s Grimeborn Festival. In concert, she has performed Berio’s Coro with the Lucerne Festival Academy Chorus under Sir Simon Rattle, and with the Norwegian Soloists Choir, as well as Vivaldi’s Gloria at the Purcell Room, Messiah at Cadogan Hall, Haydn’s Nelson Mass at St Martin-in-the-Fields, Stradella’s San Giovanni Battista (title role) for Théâtre Roger Barat, and Brahms and Schubert songs with The Prince Consort/Side by Side at Wigmore Hall. She has featured as a soloist for the Armonico Consort and in broadcast for BBC World Service Radio. Matúšstudied at the Banskobystrický Konzervatóriu (S. Matis), while at the same time graduating from Matej Bel University in Banská Bystrica. Later, he developed his Baroque interpretation at L'Istituto Superiore di studi musicali G. Briccialdi in Terni, Italy (G. Banditelli). As a soloist he has worked with orchestras such as Elbipolis Barockorchester Hamburg, Musica Florea, Czech Virtuosi, Solamente naturali, Il Cuore Barocco, Quasars Ensemble, and the Slovak Chamber Orchestra. 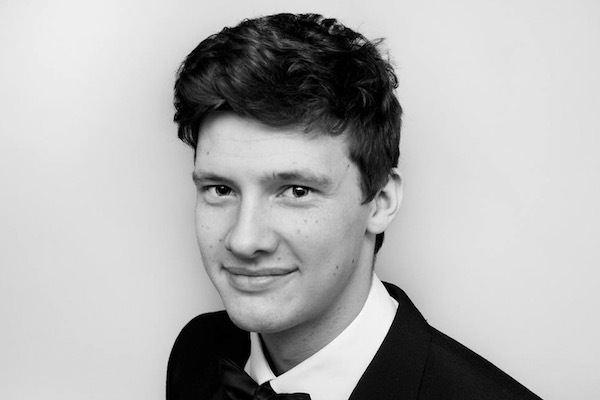 Currently he sings in the Slovak Philharmonic Orchestra and attends private lessons with prof. Vlasta Hudecová. Recent operatic roles include Pedrillo (Die Entführung aus dem Serail) Mozart. Accompanied by The Baroque Collective (leader Alison Bury) and conducted by John Hancorn. Jan Capinski: A video demo is like a Mozart aria. We have noticed many applications to our Audition Oracle Singers Preparation Award ask for help with video recordings. Severall have nominated Capinski Recordings as their chosen provider. Jan is in the unique position of being both a professional singer and sound engineer and so we invited him to share his best video recording tips for our latest blog. A video demo is like a Mozart aria - everyone should have one in their portfolio*. I’ll come back to that thought... It does indeed seem as though you can’t even get an audition these days without sending a link to your (by now painfully out-of-date) video demo. I don’t say ‘audition tape’ because that single-take smartphone-recorded ‘Your tiny hand is frozen’ video you did for that one company that asked for some Rodolfo in English was never going to stay ‘on the line’ for long, was it? And I don’t say ‘showreel’, because that’s an actor thing. No, we opera singers do demos of whole arias, and because we’re always on a budget, they’re never perfect. They’re the best we can do on the day. No reshoots the following week, and by audio-production standards - very little trickery. So here’s my first tip - even though you’re spending a lot of money, be kind to yourself and don’t plan to get anything more than ‘your best on the day’. If you haven’t done video demos before, chances are that once you’re over the initial excitement of having something to show your parents and colleagues, you’ll be itching to ‘do it so much better’. That’ll be because no one has ever taught you how to do recordings. Performances, sure! Auditions, to some extent... But no one teaches ‘being recorded’ (to my knowledge, in the UK, in opera). Which brings me to tip number 2 - It’s a learning experience! You get better at it every time you do it, especially if you record the same arias. I have a recurring client who did the same three pieces every 6 months until we couldn’t tell if the last session was any better than the previous. Since then, they bring a new aria or two every time they record with me and always nail it in a take or two. They walk in, know the room, know me, know themselves in this context, and they just deliver. Yes, they have spent a fair amount of money to acquire this ease. It’s a learning experience... so apply for funding! It’s a lot less nebulous than asking for money for lessons - your benefactor gets to see results! And you will learn a lot, regardless of whether you end up using the demos or not. Wardrobe malfunctions aside, hair is the most obvious source of continuity problems when stitching together multiple takes (over multiple camera angles, of course). Just have some foundation and powder with you, you might not need it, but you’ll hate it if you do need it and don’t have it. Think carefully before you invite your teacher to be part of the recording session! I’ve seen this been very useful, but I’ve also seen it turn a session into a lesson, basically killing any aspect of ‘performance’. My personal feeling as a singer is - I don’t have my teacher holding my hand in an audition, I should be able to deliver without them. Also, I can’t afford my teacher’s rate for 2-3 hours on top of venue hire, recording producer, etc. Your singing should be representative of what you can do, on muscle memory alone. It’s your main focus in terms of training, so it probably needs the least amount of extra care in the slightly foreign context of recording. How you perform in front of cameras, however, may or may not need some extra help. Singing like a dream isn’t enough to be engaging on screen*, and doing your finest audition-acting might not quite work in the context of fairly close up shots where we want to see your face. You don’t need to do much, but you should always be looking at something, mean every word you sing, and have purpose in every rest. Your engineer is probably busy doing the job of 3-5 people anyway, so hiring someone to look at you throughout, perhaps being the other character in the scene - I’d call that a worthwhile investment. Everyone with you in the recording room is there to give you their opinion. The pianist will treat it like something between a rehearsal, a coaching, and a performance, so they’ll give you tempo/tuning/ensemble notes. If you invite a teacher/director/best mate, they’ll give you notes as well. The producer will be on headphones, and hear things differently than anyone else in the room, so from time to time they’ll chime in to give you the microphone’s perspective. You may listen back and give yourself notes! If it gets too much (think stage-and-orchestra on an under-rehearsed show ;) ), be assertive and manage the room - ask for a break and to come back with more of a performance attitude, say it’s all getting a bit nit-picky and you feel a more relaxed approach might give better results. They need to realise it’s not about them. If they’re brilliant - that’s a bonus; but if they screw up - nobody cares. Leave their name off rather than re-do a take just for their benefit. I’ll take ‘consistent but approximate’ (playing the same take after take for easy splicing) over ‘inventive and ambitious’ any day. Unless it’s lieder! But for arias - your piano part is an approximation anyway, don’t get too precious about it. Once you’ve worked your way through a piece, nailed every cadenza, sung all the chromatic passages with impeccable tuning, etc; do one last full take, knowing you already have all the material anyway. Chances are it’ll have a lot of the stuff you worked so hard to nail in isolation, but it’ll be more relaxed, more ‘performed’, and sometimes just more adventurous in general. Once you have your 3-5 videos, see if there are any bits of them that are REALLY good. Not just showing that you can sing the aria, but showing something special and unique to you. It can be a ridiculous top note, a charming bit of acting, a note-perfect run... Then make a list of the best bits of each piece and have a showreel made. A 1-2min video that is (in essence) the best of you, maybe even including some production shots, or your most glamorous headshot accompanied by your favourite audio-only demo from that one day you were on top form. In an audition the panel apparently only need 10s to make up their minds. A showreel puts you in control of those 10 seconds, albeit online. To read more about Jan's work, please visit www.capinskirecordings.com. Audition Oracle subscribers receive a 10% discount with Capinski Recordings. Not yet an audition oracle subscriber? Sign up to our FREE basic account and also receive a no-strings-attached 30-day free trial of our Premium account. Sign-up now to be found by casting professionals and to keep up-to-date with all the latest paid opportunities and opera auditions. Tailor our Jobsboard, urgent alerts and email bulletins to your needs and get ahead of the opera audition season. 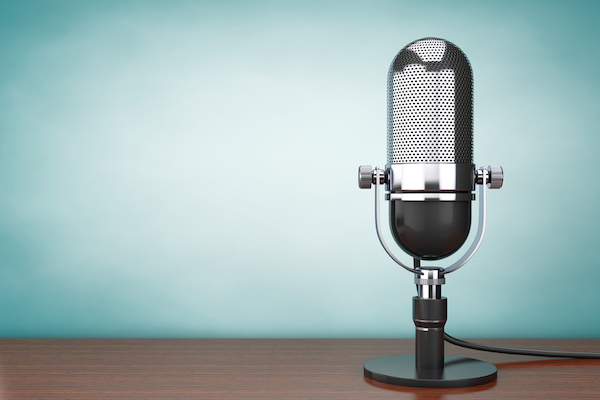 "Really enjoying the use of Audition Oracle. It’s been extremely useful whilst I am trying to start a career as a classical singer. Thank you!" Register your free basic account now and also recieve a FREE 30-day trial to our premium service! Over £3,800 of support given. Apply for our latest award today! At the start of 2018 we launched an initiative to give away £300 of support every month to a different Audition Oracle member to help them arrive at their next job, performance or project fully prepared. This was a development from our one off Singers Preparation Award back in 2017. Above are some of our hugely talented, dedicated and well deserving recipients. Audition Oracle, Opera Cabbie and many anonymous patrons have enabled us to donate over £3,800 of support to date. We love going through the applications each month and find ourselves wishing we could help every singer that applies. If you would like to donate a financial award or complementary package to Audition Oracle Singers Preparation Award please drop Melanie an email to [email protected]. To apply for our latest award, please fill out the application form below. Applications for our July bursary will remain open till the 6th of August this month as we know many of you are ensconced in your summer seasons! Audition Oracle has been created by professional singers for professional singers as a tool for opera, choral and classical artists to conect to auditions, work oportunities, companies and other artistic professionals. We are constantly improving our platform and rolling out new inovations to bring together all elements of the classical singing community. If you have any feedback on how we can improve our service, don't hesitate to email [email protected].